President Tsai Ing-Wen visited Hsinchu Biomedical Park in the morning of May 10th with high expectation on biomedical industry, and listened to the explanation from the personnel of intelligent medicine R&D with praise. 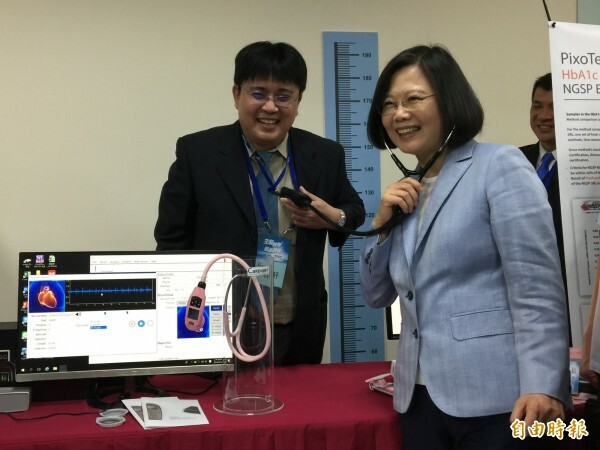 Ms. Tsai shows a great interest in and wears the electronic stethoscope of iMEDI PLUS. iMEDI PLUS, the pioneer of the development of digital auscultation system, is dedicated to developing the technology of high sound quality and attempts to combine digital health with artificial intelligence to reach the goal of AI in diagnosis and screening. With the help of such auscultation system, sounds are captured and converted into digital signals to make records and completely present the phonocardiogram. Putting an eye on the future to integrate AI in Blockchain, the algorithm of sound features and deep learning are the basis of big data to assist doctors in diagnosis. Stethoscope is not only the symbol of doctors but an indispensable role in diagnosis. Even under the rapidly changing innovation of technology, stethoscope provides the doctors convenient and immediate information at critical moments. Hence, IMEDI PLUS merges high-tech into auscultation and gathers well-known international cardiologists, emergency physicians and acoustic specialists to develop the stethoscope of best sound quality. Creating its own the brand, Cardiart, iMEDI PLUS tends to spin and stand on the top of the entire medical industry.